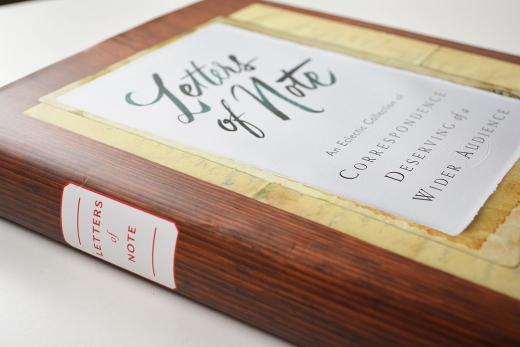 Last week in the US, NPR aired a really lovely Letters of Note series that was recorded a short while ago, in which a few people related to various letters in the book were interviewed by Audie Cornish--a couple even read their letters aloud. Those people were: Amy Corcoran, a lady who, as a young girl, received a letter from Roald Dahl; Bill Baxley, who, as attorney general of Alabama in 1976, wrote a succinct letter to the KKK; and Frank Ciulla, whose father was killed in the Lockerbie bombing and whose family received a beautiful letter from Scotland a few years later. I also read out a favourite letter of mine, written by Robert Pirosh. To listen to the series--and you really should--go here. I only wish it covered every letter in the book. I hope you enjoy it. Enormous thanks to all who participated.